Congratulations to Jenny Williams! She won the raffle prize I offered for the Menu for Hope fundraiser. Jenny, I’ll be emailing you shortly to find out which photo you’d like. The entire effort raised over $62,000. A big thanks to all who participated. This week, I baked a birthday cake for someone’s surprise 50th birthday party. The original plan was to bring a bunch of macarons, but the day before the party, I thought I should ask her husband if he had arranged for a cake. I normally wouldn’t volunteer during such a busy time, but I have a soft spot for guys who are so sweet on their partners. He was cooking dinner for 30 people, so I said I could handle the cake. I doubled this chocolate espresso fudge cake with beautiful results. Probably the most nerve-wracking part was driving it down Boulder Canyon, but the structural integrity of this cake is rock solid. Love that Marcel Desaulniers. But now my thoughts must turn to Chinese New Year and the menu I need to prepare. If you’re thinking, “Hey, isn’t Chinese New Year early this year?” you are correct. It’s January 26th, which is earlier than usual for me anyway. This also means we have to perform a thorough cleaning of the house which isn’t a high priority for either of us and certainly never a priority for Kaweah, the Agent of Entropy. The coming lunar new year reminded me that I still have a backlog of recipes to share – some of them are even Chinese! I love nian gao, which is a rice cake that is chewy, gooey, soft – like a giant slice of rice noodle. I wish I could show you a label, but this batch came in a clear plastic bag with NO writing on it other than a price and a twist tie. I had picked it up from the frozen section of the H-Mart in Denver, an Asian grocer. I know what some of you are thinking: cake = sweet. Well, I suppose you could put this in a sweet dish (sweet soup?) since it’s a neutral flavor, but I’ve always had it served in savory stir-fries or savory soups. This is a simple stir-fry that my mom makes at home. If you have rice cakes handy – should be easy enough if you live near a decent Asian grocery store – the dish cooks up in ten minutes. The prep takes a little longer, depending on your proficiency with a sharp knife. If the rice cakes are frozen, let them thaw out a bit. Frozen or refrigerated, you’ll want to soak them in cold water for 30 minutes. 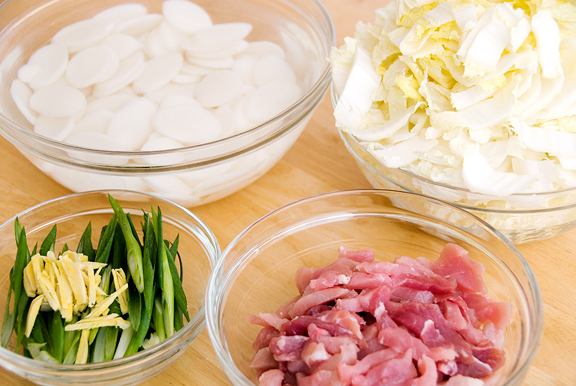 As with many stir-fries, you can mix and match ingredients as you like. 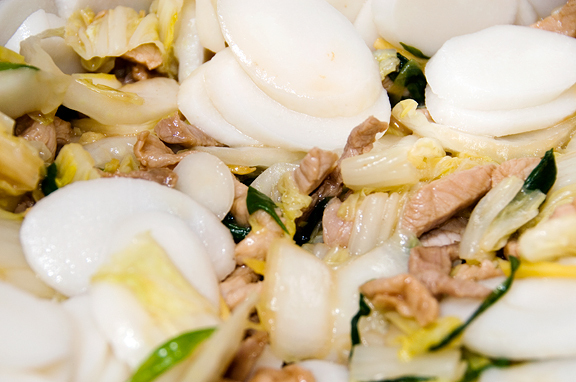 This combination of napa cabbage, pork, and the rice cakes is one of my favorites. Chinese people like to eat rice cakes in the new year because nian gao sounds like higher year or a better year. Everything has a meaning! The cabbage is sautéed in vegetable oil with some green onions and ginger. The ginger really gives a nice fragrance to the dish. 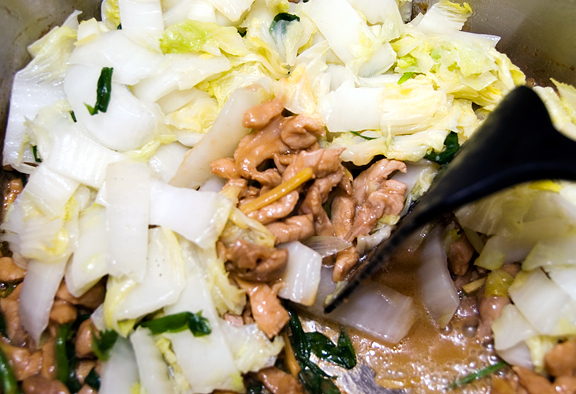 When the cabbage is nearly cooked, I remove it to a bowl and stir-fry the pork. After the vegetables and meat are well mixed, toss in the rice cakes with some chicken broth. They will feel like hard little discs, but it’s amazing what a little heat and liquid can do to transform them into addictive soft treats. Add as much broth as you like. The dish can be more or less soupy depending on your preference. As soon as the cakes are soft, remove everything from the heat and serve immediately. I like to heat the leftovers in a bowl of broth and have it as soup. 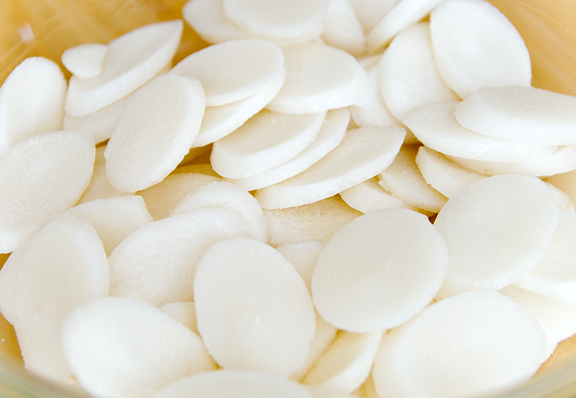 Soak the rice cakes in cold water for 30 minutes. 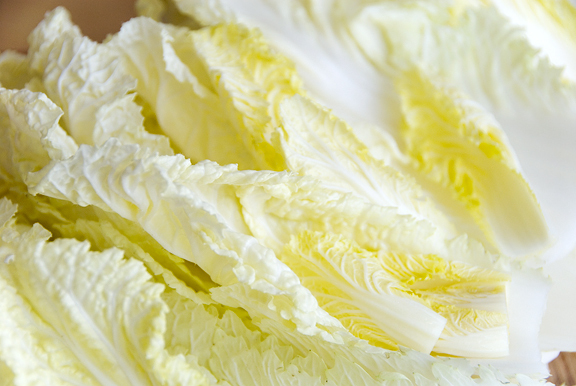 Slice the cabbage leaves into 1-inch wide segments. In a medium bowl, mix the pork, soy sauce, sesame oil, and cornstarch together until the pork is evenly coated. In a large pan or pot, heat 3 tablespoons of vegetable oil, half of the ginger and half of the green onions over high heat. When the onions and ginger begin to sizzle, add the cabbage and sauté. Sprinkle a little salt to taste. 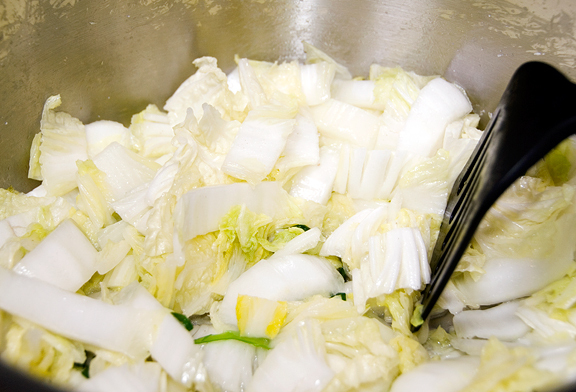 When the cabbage is almost cooked, remove it to a bowl. Heat (on high) the remaining 2 tablespoons of vegetable oil in the same pot and add the remaining ginger and green onions. When the ginger and onions sizzle, add the pork and sauté until the meat is nearly cooked through. Pour the cabbage back into the pot and stir the pork and cabbage together. Drain the rice cakes and add them to the pot along with a half cup of chicken broth. Add more broth as needed or desired. Stir the contents of the pot around to prevent sticking. When the rice cakes are soft and chewy, remove from heat. Serve hot. Congratulations to Jenny, and to you, Jen. 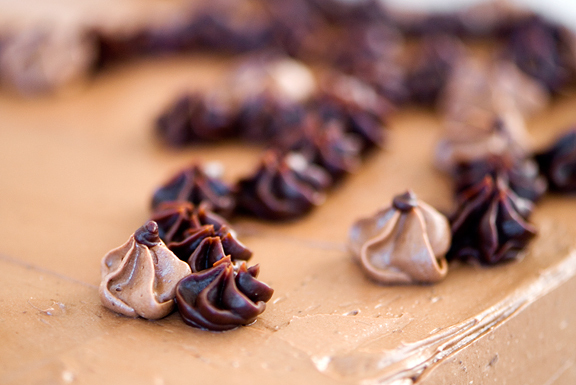 I couldn’t move my eyes off of the first photo of your chocolate cake. I think that is prize winning! And…today I learn about rice cakes. A far, far cry from those items we find in the snack aisle of our regular grocers. I do confess, initially I thought I was looking at water chestnuts. The stir-fry has me drooling, and the writing has me envious. (Your work is fantastic in all it’s forms!). Oh, and I’m envious of Jenny, too. .. Kudos to all that were involved! I think I might have almost choked on something similar to a rice cake at a Shabu Shabu restaurant in Tokyo. It was soft and chewy and I didn’t chew it sufficiently. 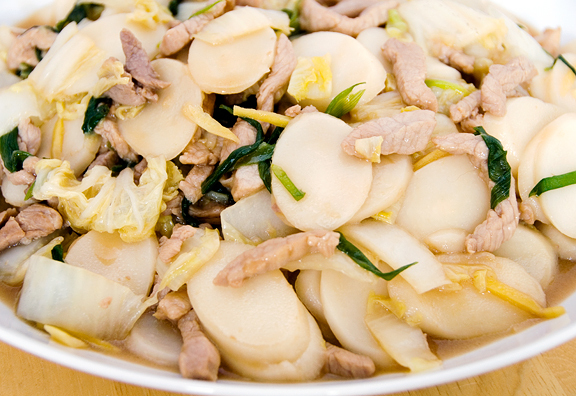 I’ve never eaten Chinese rice cakes, so your dish intrigues me! I’ll have to try this one of these days… I bet this dish is delicious! Oooh, that looks like delicious comfort food. I’d love to give those rice cakes a try – I wonder if the Ithaca Wegman’s has them? Gorgeous cake. I always cave in and bake for sweet people too. YAY!! I’m so excited! I’ve been trying to decide which one I want, really hard!! Nian Gao, Nian Nian Gao. I LOOOOOVE nian gao. LOVE it. If it’s on a menu I have to order it. Ooooh I’m really full this evening too after a dinner I made for some family and I’m STILL drooling thinking about nian gao. I actually have some in my fridge right now just waiting to be cooked up – perhaps I’ve been inspired to do so. Your recipe looks really nice and simple. Ones I’ve made before are more complicated and still not QUITE what I’m going for (Mom doesn’t make it – but some favorite restaurants do which is what I’m trying to replicate.) Gonna have to try it! For Chinese New Year this year I will celebrate – by getting Mike back safe and sound from an additional month of traveling through Africa after I left. A Happy and Prosperous and Lucky new year to you, Jeremy and Kaweah! hmmmm seems like rice cake differs from country to country. Over here, the rice cake comes is a round circular block, very much cheese, but not so big in size. My mum will slice them into 5mm thick slices, coat them in a self-raising flour batter and deep-fry them. I’m salivating while writing! Oh, by the way, the rice cake is caramel brown in colour. And in Korea, it looks like the kind you have but it is oblong in shape and fried in a tomato-based sauce if I’m not wrong. And I sure haven’t tried your version! This is all so interesting! Just the idea of plain Rice Cakes gets me going. One of my secret pleasures – secret through fear of being seen as a weirdo – is plain boiled rice, with lots of salt and malt vinegar. That is one pretty cake…wow! The year is whooshing by & sometimes I feel panic rise within me that January is already coming to a close. Can imagine how much you have to do with the Chinese New Year…all the best to you & your family! Those cakes are really cool looking. I can’t think of a single store in my area that would carry something like this though. Perhaps I’m not looking hard enough. This recipe looks tasty and fun. 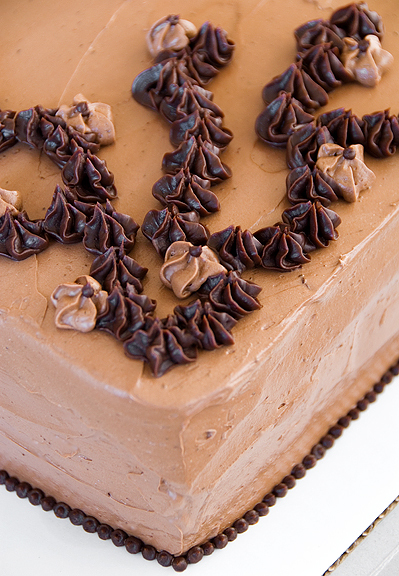 How can one post give me a hankering for chocolate cake and chinese take-out all at the same time?! *sigh* … you keep working that strange magic of yours Jennifer. By the way, I’m passing on a small award to you. It’s the “Proximity” award. You can check it out on my blog, in today’s post, where I’ve mentioned you. I thought those were water chestnuts when I first looked at them. I have never seen those rice cakes but I will be looking for them at the asian market when I go next time. I am kind of sad that the year of the Rat (my year) is coming to a close. you’re so sweet, Jen! I wish you all the best for this coming new year :) your food always rocks and am looking forward to more and more to come!! Congrats, Jen!! On being nominated as one of the best food blogs! Woo hoo! You know who I voted for! Happy, Healthy, Prosperous New Year to you! Like Mrs. Ergul, my concept of nian gao is different. Those coins look like something I see in Korean cuisine. Not saying you’re wrong or anything. Just interesting that the same name is used for different foods. I’m looking at your dish and thinking it might need some strips of red bell pepper and maybe a splash of rice wine vinegar. I came to find your site by Manisha’s recommendation, and I do love it. And congratulations on the Food Blog Award nominations! We have a bag of those rice cakes in the freezer and will have to try your recipe as an alternative to our usual way of cooking them, which is in soups. Lovely recipe, thanks for sharing! jen, xing nian khuai le; it is not usual for us to have nian gao; but when we visited chinese restaurant during the lunar new year; they served special nian gao with mustard green, and egg drop. it’s very good! do you make your own nian gao? Margie – yeah, rice cakes are not the same as those puffy things. I guess they do look like water chestnuts, eh? Barbara – oh lordy! I am glad you DIDN’T choke, my love! Amy – you know, Ithaca Wegman’s may not, but there was a little Asian grocery out past Wegman’s that had them… I can’t remember the name, but it was on the right as you headed out of town. Dawn – hee hee, we must be suckers! Beatrice – great :) I really hope you like them (and find them). Mark – yes, tis true how we love our blandness. You are too funny! Jie – xieh xieh! My mom explained it to me :) Thank you, you’re so sweet. Gong Xi Gong Xi!! Steph – ha ha, that’s awesome! I hope you have a GREAT new year and happy bday too! Mollie – Well hon, I keep tellin’ ya, if you come to visit, I will teach you how to stir fry and I’ll feed you too! Mrs. E – we get the circular blocks too, but I think those are sweet? Yes, and we slice them and fry them. Awww, thank you hon. I wish you the very best too. gong xi gong xi… quai le quai le!! Deeba – thank you! It *is* flying past isn’t it? Craziness… Wishing you the best too. Muneeba – you are so sweet. thank you for the award! I will go check it out. Tony – no, YOU’RE so sweet, Tony! I love your blog. Don’t ever forget that. I just have been a total lameass and haven’t had time to get around to many of the blogs I normally visit. Forgive me. Happy new year, sweetie! Lori – thank you. All the very best to you too. Rose – mmm, I love mustard green :) I don’t make my own nian gao. I’m too much of a bum. I just buy it if I can find it :) Happy new year! gong xi gong xi!! I am Korean and didn’t realize that Chinese ate Dok (Korean rice cakes) too! I love those things! I’m addicted! I never really thought of stir frying them, but now I totally will; this week for sure!. It sounds delicious! Adeline – I love rice cakes done that way. Never had them the Korean way (would love to though). hey, thanks for this recipe. I’ve long enjoyed rice cakes but the only instructions on them (the korean ones) suggest making them into a soup based dish. I prefer them in a stir fried dish with a good amount of sauce. Soaking them just like rice noodles makes perfect sense though. Do you ever have any trouble reheating rice cakes? they always seem to soak up all available liquid and can meld into a giant mass of rice cake. I’ve reviewed some of your recipes and was forced by the growling in my belly to create a special bookmark for this site. The photos are excellent! and the steps in preparation appear complete and useful. I can’t wait to try this recipe. My wife was about to toss out a bowl of cold rice from Monday’s dinner and I said, “Wait”. I am a decent cook and I hate to waste food. I mixed in some eggs, breadcrumbs, french herbs and parmesan cheese, rolled the patties in breadcrumbs and fried the little buggers up! A little marinara over the top and POW! Lunch. Can’t wait to get to the asian market to try these. Love all foods! Have not one food dislike. Thanks! Any idea how to make these rice cakes at home? Does your mum has any idea? Irene – that, I don’t know. Sorry! This food is absolutley Korean, not Chinese. There is not this rice cake in China. only Royal family long time ago. This is was exactly what I was looking for.